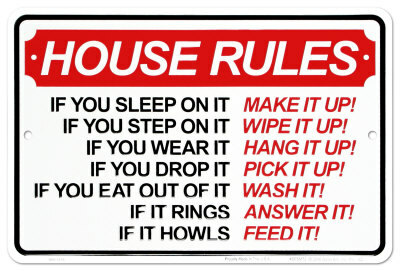 Do you have house rules? 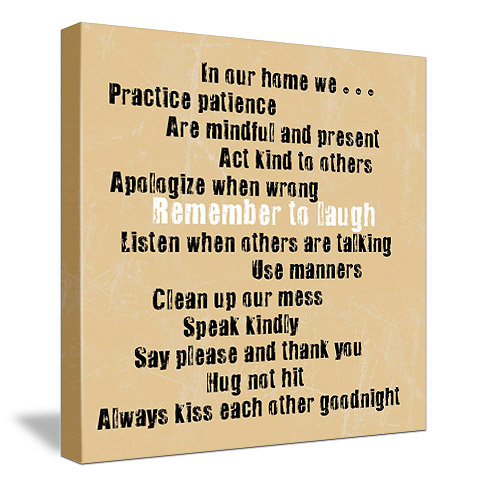 We've struggled with house rules a lot over the years. Mainly because we don't have a concrete list of house rules. There are about a thousand things the Grumpy Old Man and I tell the kids they shouldn't do around here, and they are often followed by, 'You know that's against the house rules...' But in all fairness, there are no concretely stated house rules in this house, so the kids are unlikely to keep track of all one thousand things they're not supposed to do. Today I decided to sit down and write our house rules. I know popular psychology suggests having a family meeting and everyone agreeing on the house rules, but this seems overly manipulative to me because after all parents are always going to steer the choices towards what they think is fair or reasonable. Otherwise, 'The bedroom will be divided into quadrants and each boy can only access their own quadrant and requires the permission of the owners of the other quadrants to access those.' would result in alliances being drawn to prevent some brothers from entering the room at all, or leaving it again once permission to enter was granted. Little boys are merciless! So, yup, I took the 'benevolent dictator' approach to writing the rules of the house. Do what mum and dad ask you to do when we ask you to do it - without argument. Be kind to your brothers. Following the K.I.S.S. * principle there are only four rules; to give anyone a good chance at memorising them. Rule number one might seem open to abuse, but as their parents we will endeavour to always be fair and just - we just want them to know we're sick of the 'But! 's and the 'Why do I always have to..?'s. Rule number two might seem obvious to most people, but alas not so to our little mercinaries boys; one in particular but all of them to some extent. If these boys can learn to be kind to one another as a general rule, that would eliminate about 90% of the disharmony in this home. The Grumpy Old Man and I try to model being kind, but we must be doing it wrong, because the message isn't seeding. 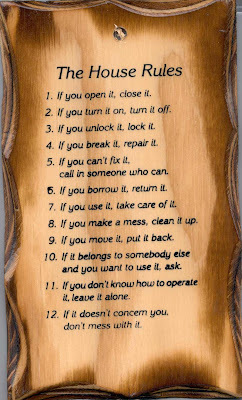 Rules number three and four are mostly related to rule number two, but sometimes go outside the bounds of brotherhood and even outside the household - sad to say. 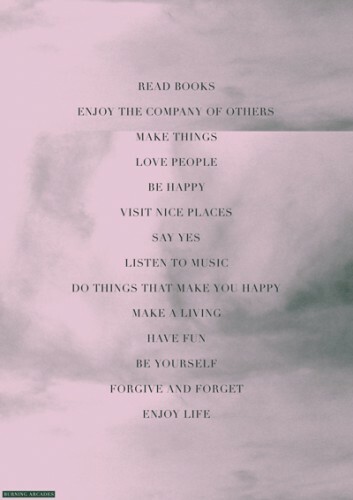 Again, following these two simple rules would make a huge difference to the flow of harmony in this household. As you can see, our household rules are fairly minimalist. Some people like funny household rules, other people like all lovey-dovey, warm and cuddly household rules (I suspect they may not have four boys aged 3-12). Those wouldn't really work for us. We laugh a lot anyway, and we love a lot too, we don't need rules to do those things, but we do need to set some simple, plain old-fashioned boundaries for the well-being of all concerned. *K.I.S.S. stands for Keep It Simple, Stupid. It’s actually a nice and useful piece of post. I am glad that you simply shared this with us. Thanks! Being the tyrannical Patriarch in most of my relationships I only have one rule ..
Rule #1 Don't upset Mum. 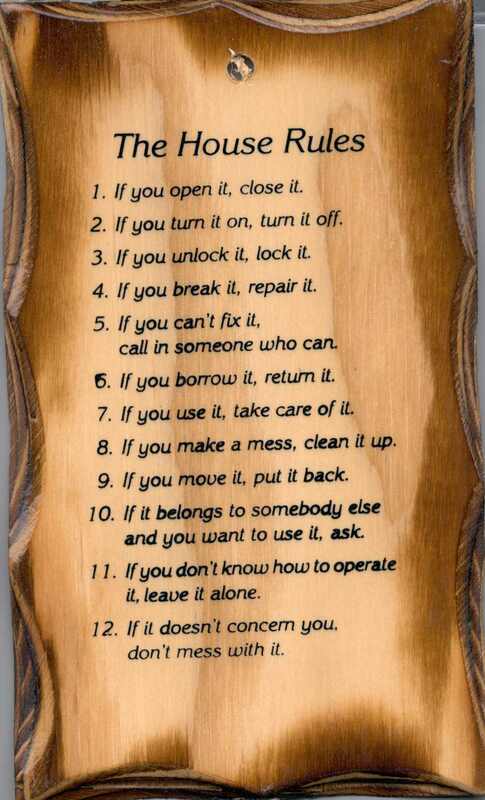 Love it Sif, Very timely for me as I realize we need some rules to keep this household running smoothly also. Scuzzi, that's a brilliant rule - it's so all encompassing! 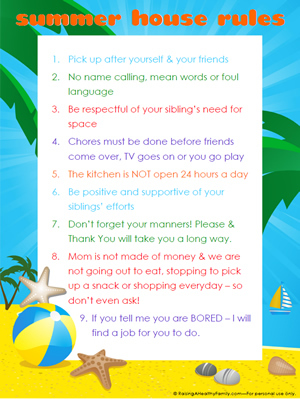 Sarah, I employ that final rule on the rare occassion my kids forget house to entertain themselves without technology!